When it comes to passenger transport many of us, if not all, have our favorite mode of trasport. Of course, it also depends on your origin node and destination node -- where you are located, say, point A, and where you want to go to, say, point B. When I teach my Transportation & Logistics class at the Isenberg School of Management, I always ask my students what their favorite mode of transportation is and, interestingly, over the past several years, I have been getting more and more responses of TRAINS! Of course, many of the students who respond thus are those who have been lucky to have had opportunities to travel outside the U.S. and they speak of great rain rides in Europe, Canada, and, sometimes, even in Asia! But trains are also being used to carry cargo and freight trains have been in the news lately, including the really bad and sad news of the Montreal Maine & Atlantic Railway (MMA) train that derailed with 72 oil tanker cars in Lac-Megantic, Quebec, with an estimated loss of 50 lives. This was North America's deadliest train accident in over 20 years. The cargo was a highly flammable oil so the cargo was hazmat (hazardous materials) and there was only one crew member operating this train. Speculation lies with a brake issue -- the operator was asleep in a hotel when the runaway train barreled on and exploded, devastating the small town and community. Clearly, choices had to be made in terms of which mode of transport to use for the cargo, and since pipelines were not available to transport the oil obtained by fracking in North Dakota, it was decided to use rails to get to the refinery.There has been a 28,000% increase in the amount of oil shipped by rail over the past 5 years. Getting the oil to refineries, as in New Brunswick, for example, which are not connected by pipelines (the new oil supply chains), is driving the growth in this freight mode of shipping. We use different criteria in selecting our optimal passenger modes and, in the case of the Quebec freight train disaster, safety as a criterion was not a priority. Only having one crew member for this train was shocking. Every airplane pilot needs a copilot. Now, let's journey to the other side of the globe -- to Asia, where a "new" mode of transport that follows ancient routes from the colossal manufacturer China, with the help and vision of U.S. companies, notably, Hewlett-Packard (H.P. ), the high tech company, is changing the supply chain distribution landscape and the new economic geography. I was delighted/ecstatic to read in a captivating article, "Hauling New Treasure On the Silk Road," in the Business section of yesterday's edition of The New York Times, the following statement: persistently high oil prices made the cost of airfreight daunting -- as much as seven times the cost of rail freight. H.P. was also concerned about the carbon emissions involved in air freight, which are 30 times those of the rail or sea routes. Impressive -- H.P. is using freight trains for shipping its high value, high tech goods, manufactured in western China, over 7,000 miles, with some trains as long as one half mile, to Europe because it cares about sustainability! And, the article notes that the crew is replaced every 3 to 4 hours and the shipments tend to arrive from the origin node (western China) to the destination node -- a distribution center in The Netherlands in 21 days. H.P. has even helped out with customs software to make the processes flow more smoothly and more reliably as the precious cargo transits through Kazakhstan and onwards west to Europe. H.P. has pioneered the revival of a route famous and known as the Silk Road since the Roman Empire. The Romans certainly knew a lot about transportation and I even brought that out at The New York Times EnergyforTomorrow Conference in NYC on April 25, 2013 -- you can view the video here. However, now the precious goods that are hauled are transportd by freight trains at certain frequencies, and not by horses and camels, as was the case back in 120 B.C. Plus, the cargo is quite different from that of over 2,000 years ago, with the exception of perhaps the precious silks for European markets! For all the transportation geeks and train buffs out there The New York Times has some great photos of what you might encounter on this journey. Of course, H.P. is also using other modes of transport but, given, the investments of many countries along the freight rail route, as well as interest by other manufacturers and freight service providers, including DHL, it has certainly started something very positive and worthwhile both economically and environmentally. Coincidentally, the most recent paper that I co-authored is on this general topic: Supply Chain Network Sustainability Under Competition and Frequencies of Activities from Production to Distribution, Anna Nagurney, Min Yu, and Jonas Floden. Finally, a few days ago, I had a great conversation with a New York Times reporter, Kirk Johnson, on the failure of the CRC project, which consisted of a new bridge joining Portland, Oregon with Vancouver, Washington after $175 million in planning was spent. The plan called for combining freight, private and public transport (including bicycles) on the bridge. You can access the full article with my quotes here. Now is the time of the year when those of us who are lucky enough to live in areas with a lot of fresh produce can enjoy nature's bounty. 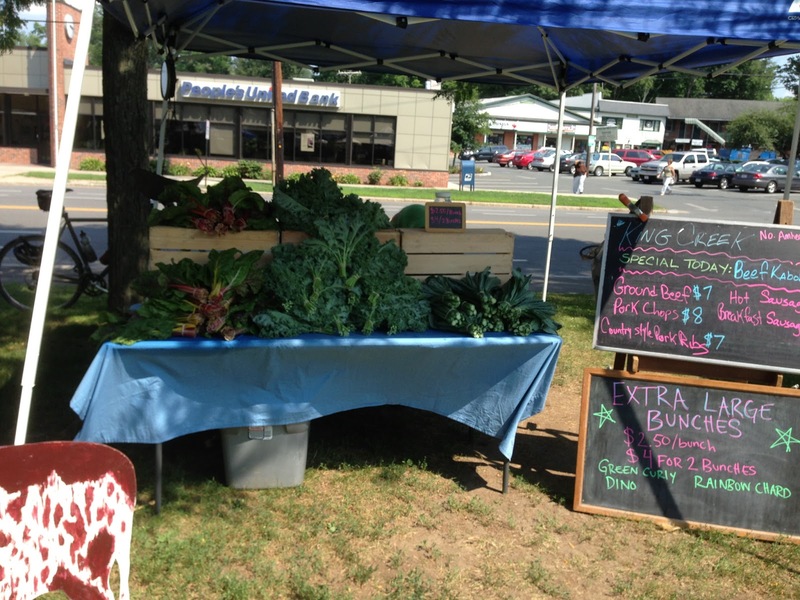 Below is a photo taken this past Wednesday of a produce stand at the Amherst Farmer's Market and the bigger one takes place on Saturdays. However, there are many locations throughout the U.S. that are known as food deserts, with the USDA defining a food desert as: parts of the country vapid of fresh fruit, vegetables, and other healthful whole foods, usually found in impoverished areas. This is largely due to a lack of grocery stores, farmers’ markets, and healthy food providers. The term food desert applies to lower income areas that don't have easy access to grocery stores with fresh, affordable food. The food desert standard according to the USDA is that—among other factors—20 percent of its households have no vehicle and live more than a half-mile from a supermarket. The USDA has even come up with a food desert locator and you can access the map directly. 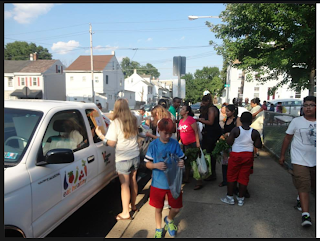 Our local New England Public Radio station not that long ago aired a fabulous two-part series on food deserts with a focus on the Springfield, Massachusetts area. We know that the consumption of nutritious food, especially in the form of fresh fruits and vegetables, affects health and longevity as well as children's ability to focus and learn. But if urban dwellers or even rural dwellers cannot easily access fresh produce what can be done? Having spent a lot of time in Sweden, on my sabbatical this year, and on several other occasions, as well, which I have written about on this blog, I was continually amazed at how accessible good fresh food was. In fact, during my most recent stay, May 25-June 25, 2013, in Gothenburg, my apartment complex had views of trees and a fountain and was right above the Tempo store. I often walked a few blocks to a big fresh produce market, however, since the selection there was even greater. College students, and recent grads, with support from faculty and their communities, have been researching possible solutions to the food desert problem in the U.S., and, according to the USDA, there are thousands of census tracts in the U.S. that qualify as food deserts! I was impressed by these Northeastern University grads, who have a business model, and are even using Kickstarter for their fresh produce bus initiative in the Boston area, with nice recent coverage by The Boston Globe. 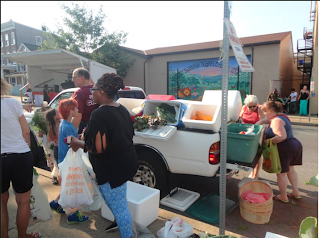 Lafayette College, in Easton, PA, which is my husband's alma mater, through its Tech Clinic, which focuses on having students and faculty solve real-world problems, has been focusing on both community gardens and a veggie truck, with the initial launch this past week. The veggie truck is modeled after an ice cream truck but the produce is distributed free! 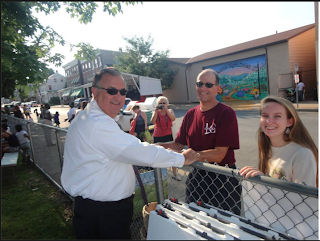 Its launch was covered by the Easton Patch and a local blogger, Christina Georgiu, also did some great coverage. 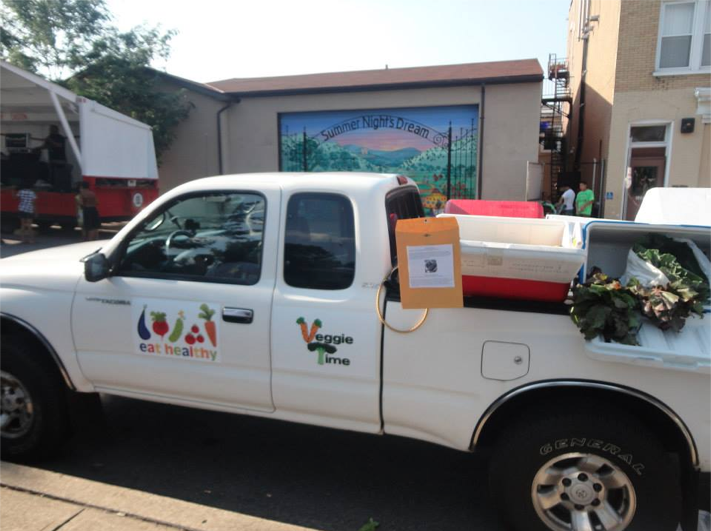 Those involved did not know if anyone would show up for the fresh veggies, that are locally grown. 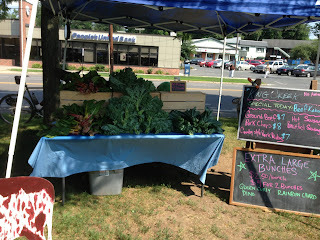 Cristina noted that more than 90 percent of the vegetables were eagerly snatched up in about 15 minutes! The veggie truck in Easton, PA - even the Mayor showed up in his long-sleeved white shirt! Now some challenges remain, which include how to make this model sustainable and how to determine an equitable distribution policy. I hear that even a recipe book is planned! I am sure that the students and faculty will use their critical thinking and analytical skills to figure it all out! In the meantime, congrats on the great initiatives that help communities! As an operations researcher and management scientist, who with students, has researched even perishable food and sustainability, I love to see positive ideas and logistics in action! 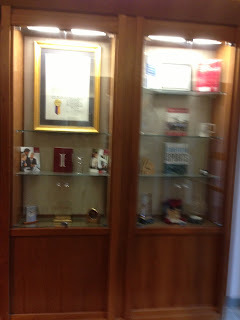 Coincidentally, yesterday, while at the Isenberg School of Management, I ran into Dr. Stephen Jefferson, one of my terrific Sport Management colleagues, who told me that he grew up in the West Ward of Easton and it was a Lafayette College grad who served as his basketball coach and who inspired him to go to college! I told him about the veggie van and he was so pleased since he still has family there. And, speaking of operations research and management science (ORMS), along with food distribution for healthy communities, I would like to also give a plug to one of my colleagues, Professor Senay Solak, whose advisor at Georgia Tech was Dr. Ellis Johnson, renowned in OR. He, along with one of our MBA students, did a project for the Food Bank of Western Massachusetts. I hope that you are comfortable wherever you are. The U.S. from the Midwest to the Northeast is in the midst of a major heat wave with scorching temperatures. The impacts on comfort, air quality, and human health have been great. The same holds for the pressures on our electric power grids and the associated supply chains. Even our local paper, the Daily Hampshire Gazette, had three feature front page articles today with the headline RECORD SETTER? One of the articles noted that the heat wave is putting stress on the power grid and the demand this week may outpace that recorded back in August 2, 2006. 2 out of the top 10 demands for electric power in our community occurred in July 2006 and 3 in August 2006. ISO New England, which is the Holyoke agency that operates the power grid for the six New England states reported the above results and is warning the region to decrease demand and take other measures to reduce electric power use. I toured the ISO New England facilities with a group of our UMass Amherst INFORMS Student Chapter members a few years ago -- simply stunning and fascinating and to see the optimization in action on huge screens was a real thrill for all of us. ISO New England is responsible for the reliability of electric power in New England, a big task. Interestingly, my former doctoral student, Dr. Zugang "Leo" Liu, and I published a paper, An Integrated Electric Power Supply Chain and Fuel Market Network Framework: Theoretical Modeling with Empirical Analysis for New England, in the Naval Research Logistics 56: (2009) pp 600-624, which used a dataset for precisely the hottest month reported by ISO New England and, in the paper, we captured both the economic and engineering aspect of this electric power supply chain with alternative fuel sources. This topic is very timely and even my fellow Brown University classmate, Matt Wald, writes in The New York Times about the complexity of the electric power grid and the many decision-makers involved in his feature, "Ideas to Bolster Power Grid Run Up Against System's Many Owners." Plans are calling for a redesign of the U.S. electric grid, which could also significantly lower emissions. Kai Wu, Anna Nagurney, Zugang Liu, and John Stranlund, Transportation Research D 11: (2006) pp 171-190. We have the models, algorithms, and insights to bring our electric power grids into the 21st century but it seems that we lack the political will. From investors to educators and the media there is a storm of attention being paid to entrepreneurship with initiatives ranging from the much-publicized Venture for America, founded by a fellow Brown University alum, Andrew Yang, to newly formed centers, even here at the Isenberg School of Management, which is headed by my colleague, Professor James Theroux (he is the brother of the award-winning travel writer, Paul Theroux). There are also well-established entrepreneurship programs, typically, at business schools. 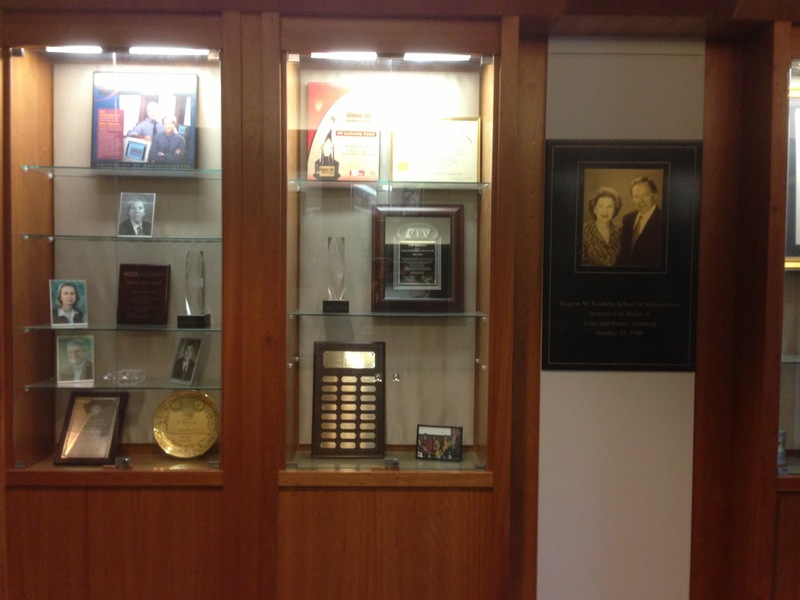 The Center for Entrepreneurship is only of several centers at the Isenberg School. For example, back in 2001, I founded and continue to direct the Virtual Center for Supernetworks. We both agree that the latter definition, which considers any enterprise ... as being the relevant one today. To survive and thrive in academia, including business schools, one must be entrepreneurial. One can't just sit back and leave the status quo, since the environment in both business and academia is much too dynamic, evolving, and changing. Entrepreneurship goes hand in hand with innovation. No new courses will be offered. No new programs and majors started. No new partnerships, including global ones, initiated. No centers established nor grants obtained. An academic institution will fail to evolve and thrive. Business professors, in particular, are great at seeking out new opportunities -- it is Darwinian -- if you don't take risks and initiate, you rot -- and the students and institutions suffer. We are also quite good (thanks to the professors that we have had and, for some of us, actual industrial experience) in allocating our scarce resources in as optimal of a fashion as possible in order to get the highest return with some risk involved, of course. I think that this is part of our DNA. If you don't have courage and take risks, nothing valuable or interesting happens -- Nothing ventured -- nothing gained. Of course, companies have also been formed by business school profs and we in operations research and the manageement sciences can name a few easily off the tops of our heads. As importantly, the students that we have educated and inspired go on to organize and manage their enterprises through their initiatives! What is more entrepreneurial than an excellent doctoral dissertation?! Collaborations are great for science and they are also fun. It is very rewarding when you work together on challenging problems that you are passionate about and get results. One of my passions is sustainability and developing mathematical models using networks, optimization, and game theory to assess and analyze supply chains in a holistic manner both from cost and profit perspectives as well as from their environmental impacts. With two great co-authors, Professor Jonas Floden of the School of Business, Economics and Law at the University of Gothenburg in Sweden and Professor Min Yu (an Isenberg PhD '12 in Management Science) of the Pamplin School of Business at the University of Portland in Oregon, the paper, "Supply Chain Network Sustainability Under Competition Frequencies of Activities from Production to Distribution," has now been completed. The paper, was inspired, in part, by my paper, "Design of Sustainable Supply Chains for Sustainable Cities," which is now available online in the journal, Environment & Planning B. Now for the challenge: the deadline for submission of our new paper for a special of a journal was fast approaching. The theme of environmental applications for the journal special issue was inspired by the year 2013 having the theme Mathematics of Planet Earth. I was back from Gothenburg, Swedem, where Professor Floden and I had numerous discussions on environmental sustainability, use of alternative transport modes, and various surveys and case studies in Sweden and Europe. Professor Yu was in China, having attended a conference on supply chains and visiting her family. Jonas and I were also interviewed by a journalist from San Franciscoon congestion pricing and the feature appeared on SmartPlanet. We were literally communicating and working on our paper around the clock with a 6 hour time difference between ET (in the US) and Sweden and another 6 hour one between Sweden and China. In the past two weeks, we have dealt with some major drama -- but the news is all good and we can breathe sighs of relief. Sichuan province, where Min was based for a while, has encountered the worst floods in 50 years and you may recall that it was also the location for the major earthquake in 2008. In our paper, we not only capture competition among firms through their supply chain networks, and assume that they produce a differentiated product, but we also include frequencies of the various supply chain activities from production to storage to ultimate distribution to the demand markets. In addition, each firm weights its environmental emissions throughout it supply chain in an individual way. We focus on GHG emissions, especially carbon, but our framework is sufficiently general to also be applicable to emissions of particulate matter (PM). PMs have recently been the focus of much media attention due to their huge negative impact on air quality and human health from China to the United Kingdom and even the U.S.! We allow for multiple options, which is especially relevant when firms have choices associated with transport models. Our computations reveal that not only can reducing emissions be good for profits but choosing the right transport mode (intermodal, for example, or the right size truck) can reduce emissions. You may recall the milk run load paradox, discovered by one of the PhD students in Gthenburg, Niklas Arvidsson, that I have written about, which further shows that one needs to include the load (think flow in network parlance) to calculate emissions, as we do in our paper. Our model can be applied to products in many industries from food and fast fashion to high technology products and demonstrates that a firm's smart action and wise choices in a highly competitive environment can be good for both business and the environment! On this blog, I sometimes offer professional advice, which can range from tips on getting an academic job in business or engineering, to acing interviews, to building networks to giving a great academic talk. The Female Science Professor has a great essay in The Chronicle of Higher Education on Talking the Talk. She is a long-time blogger who has kept her anonymity. In her essay, she discusses the importance of knowing about the audience before you give your presentation (easy when you are teaching a class) and highlights some of the things that she has experienced during her presentations (outside of the classroom) from technology malfunctions to fire alarms going off to audience members getting ill to she, herself, feeling ill.
She also notes the effect of audience members (on her) who may not be paying attention. 1. Giving a talk at the Fogelman College of Business and Economics at the University of Memphis in 2008 at a breakfast for business folks which they had to pay for ($25) and the power went out over most of the campus -- yes, the scrambled eggs got cold. This means also that the projector did not work but people patiently waited for over 30 minutes with me, the power went back on, and the show went on. Thanks for your patience and waiting! Coincidentally, my presentation was on “Synergies and Vulnerabilities of Supply Chain Networks in a Global Economy!" 2. Spraining my ankle in NYC the evening before the EnergyForTomorrow Conference on April 25, 2013. After arriving on Amtrak, I trekked to the Times Square Hilton, where The New York Times folks had put me up at, unloaded my luggage, and then continued to explore the city that I love. I took a pitstop at the Plaza hotel, stepped down a stair, and felt a pain in my ankle. No problem, I thought, I needed my exercise, so I headed to the Apple store, the only one open 24/7 in the world, and then managed to make it back to my favorite Turkish restaurant on 57th Street. When I got up from dinner, I knew that I was in trouble. I hopped back to the Hilton and that night I literally crawled on hands and knees because the pain was so bad. I elevated my ankle and prayed. I had visions of me having to be carried to speak on the Transport and Traffic panel, which was moderated by Joe Nocera, and which was going to be videotaped. The next morning, I used "mind over body" and told myself my ankle was fine and when I enterred The Times building there was an audience member on crutches and with her foot in a cast, who had broken her ankle the evening before stepping off a curb. I managed to gracefully walk on stage somehow (actually, I think that my heels helped) and the show went on. 3. Arriving with only 5 minutes to spare at an INFORMS Chapter presentation in Dallas, Texas at SMU, after numerous flight delays. The taxi driver was asking me for directions! This was one of ny favorite talk experiences ever since the audience was a terrific mix of practitioners and academics and students -- thanks! 4. Having the technology fail during the AAAS Symposium in Boston that I organized on Dynamics of Disasters and which took place on February 17, 2013. Apologies to my colleague, Professor David McLaughlin, who was giving a brilliant talk on radars and tracking tornadoes, when this happened. Luckily, my husband was in the audience and marched to find some techs for assistance. The show went on and we did not lose any audience members -- thanks! 5. Giving a talk in St. Petersburg, Russia, at which there was a translator seated in a box. I started my presentation in Russian-- he freaked out and ran out of the room. There are more -- feel free to share with me your "disaster" stories about giving a talk. Let me leave you with the story of a job candidate in academia who was so nervous at his job talk presentation that he fainted. This was in NYC. The ambulance came -- he lived but, regretfully, did not get the job. When I was a college freshman at Brown University in Providence, Rhode Island, I was not fully aware of the caliber and reputation of the faculty that I had in Applied Mathematics and other fields. For example, I was taught calculus my freshman year by Professor Joseph LaSalle, one of the luminaries in dynamical systems, and, from that point on, I knew that problem-solving, using math and optimization, coupled with computers, would be one of my passions. Spending (lots of) time visiting him during office hours to chat further inspired me. I was extremely lucky and had some of the finest faculty in fields from operations research to economics to biology and other sciences to languages and literature (I think that loving to learn languages and even computer programming languages must be related to loving math). My professors, when I was an undergraduate, and then a graduate student at Brown, were leaders in their fields and leadership came through research. They were pioneers in so many ways and gutsy (Stella Dafermos, my dissertation advisor at Brown, for example, I have written about on many occasions). What I love about the Isenberg School of Management at UMass Amherst, in addition to our wonderful students, from our undergraduates to our PhD students, is the research that takes place here. You can get a sense of some of the exciting research that goes on by accessing the latest edition of the Isenberg School's Research Beat, which was put together by our terrific Associate Dean, Dr. Jane K. Miller. Great research creates outstanding synergies with teaching and education and, after my return from Sweden, as part of my sabbatical, I was delighted to see the transformed display next to the Isenberg School's gorgeous atrium that features some of the recent faculty accolades that I captured in the photos below. It was great to see our latest book, Networks Against Time: Supply Chain Analytics for Perishable Products, also displayed! The Isenberg School has departments ranging from Accounting and Management and Marketing to my newly formed (after the split of the Department of Finance and Operations Management due to our growth) Operations & Information Management Department to the Mark H. McCormack Department of Sport Management and the Hospitality & Tourism Management Department. For all of you analytics types out there, you can see the cool applications and possibilities, I am sure! 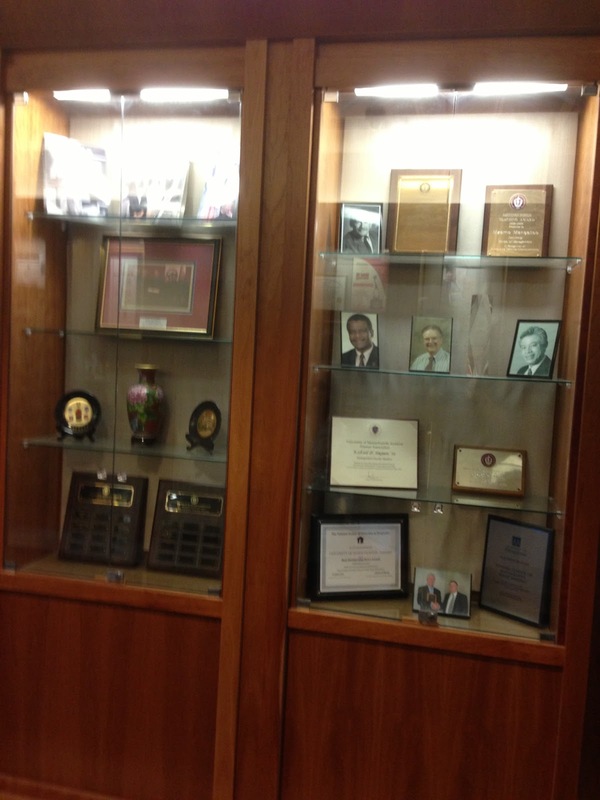 We have 6 named chaired professors (I am forever grateful to be the holder of the John F. Smith Memorial Professorship in Operations Management) and have numerous books that the faculty and even staff have authored. In addition, and this is a sign, in part, of the esteem held by peers, we (especially members of my department) have also been successful in having had sustained research funding support, which is not common in many business schools, but further attests to research emphasis and productivity. Research grants for the year are also included in the Research Beat, along with editorial roles of faculty. Finally, it is the research that you do and the impact that it has that truly matters and since I am such a proud academic mom, I have to share with you a photo emailed jto me just yesterday, which was taken in Vienna, Austria, just after the EURO INFORMS Conference in Rome, Italy, and before the International Symposium of Logistics with the theme of Resilient Supply Chains in an Uncertain Environment, in which my former doctoral student, Professor Tina Wakolbinger is on the local committee. The Vienna conference begins tomorrow. (l-r) Thomas Nowak, PhD student of Professor Tina Wakolbinger, Professor Fuminori Toyasaki of York University, Professor Tina Wakolbinger of the Vienna University of Economics and Business, Professor Dmytro Matsypra of the University of Sydney, and Professor Jose M. Cruz of the University of Connecticut. All the above Professors were my PhD students in Management Science at the Isenberg School and now are educating another generation of students on three continents. 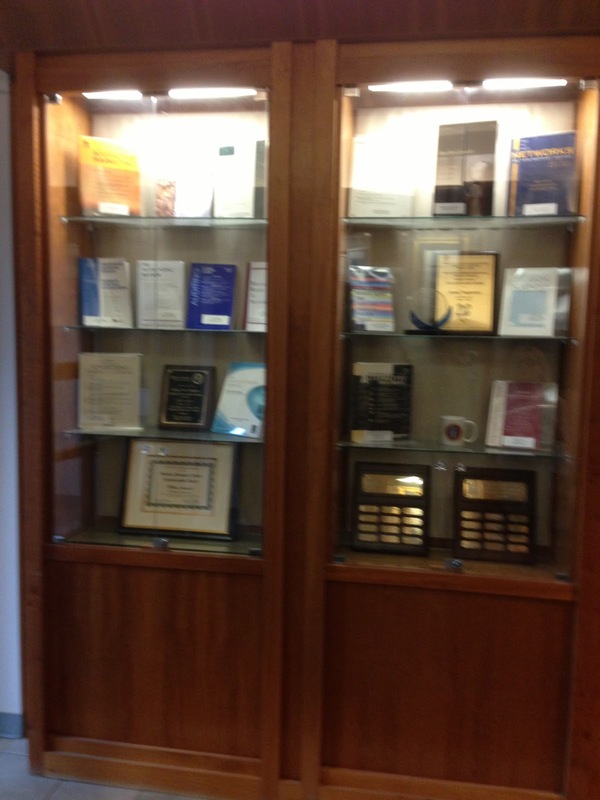 You may find their dissertation abstracts on the Supernetworks Center website. Plus, all in the photos above, except for, of course, Thomas, who is still a PhD student, have tenure at their respective universities. He will be my first official academic grandson since Tina was my academic daughter. The Research Beat Goes On and this is Great! I have been back in the US for over a week now and miss the fresh, cooler air of Sweden. Massachusetts has been sweltering but I refuse to install air conditioners in our home and we use the trees around our property for cooling (natural) along with some fans. I do not want to add to global warming. Policies can also make a big impact on our environment and I have written two books that focus entirely on the subject: Environmental Networks (with K. K. Dhanda and P. Ramanujam, two former doctoral students of mine) and Sustainable Transportation Networks. Several other of my books also provide math models, analyses, and algorithms for environmental decision-making. It is important to study policies analytically before implementation and my collaborators and I have written many papers on topics ranging from pollution permits, carbon taxes, to sustainable supply chains. In fact, we are presently finishing up a paper on competitive sustainable supply chains with examples from around the world. I am working with Professor Jonas Floden from Sweden and Professor Min Yu, who is a Professor at the University of Portland, but is spending part of the summer in China. My passion is a clean, healthy environment, and that is one of the reasons that this year and last year I have been spending a lot of time in Sweden as a Visiting Professor at the School of Business, Economics and Law at the University of Gothenburg. My host there has been Professor Jonas Floden and a few weeks ago we were interviewed by a journalist, May Catherine O'Connor, who had traveled from San Francisco to Gothenburg to observe the imposed congestion pricing scheme in practice. Mary Catherine, Jonas, and I had fabulous discussions on transportation and congestion pricing and the experiences in both Gothenburg and Stoickholm, capped with a lunch in Haga. Jonas and I had to indulge in the Swedish neatballs with ligonberries but Mary Catherine is a vegetarian so had a really nice fritatta. Congestion pricing was instituted in the city of Gothenburg in January 2013 and I can personally see the difference in road traffic. The city was very proactive and instituted more frequent bus service, provided public transport passes to commuters for several weeks, and offered free parking in downtown on weekends. There are separate bus lanes to improve the flow of busses and, of course, numerous pedestrian lanes and bicycle lanes. I continue to marvel at how extremely fit the Swedes are and miss the hours of walking that I would do every day as just part of life -- even bringing groceries home by foot and walking to and from work. Ms. O'Connor has now written a piece, Congestion pricing: Does it make cities more car-free?, for SmartPlanet, which appeared yesterday, July 4th. You can read her article here. I am very much looking forward to teaching my Transportation & Logistics class this fall at the Isenberg School of Management in which we discuss how tolls can be quantitatively formulated and then applied. Some of this classical work goes back to Stella Dafermos, who was my doctoral dissertation advisor at Brown University and the second female in the work to receive a PhD in Operations Research! It is exciting to see analytics being put into practice to make a better planet for all of us! And, for a set of lectures on transportation and logistics, including toll setting, please feel free to see my lectures on these topics. 2013 EURO Gold Medal Winner in Rome is Professor Panos M. Pardalos! I was aware that the good news was coming but now that it is official we can all celebrate. Our dear friend and colleague, Distinguished University Professor Panos M. Pardalos of the University of Florida, has been awarded the 2013 EURO Gold Medal at the Euro INFORMS Conference in Rome, Italy. 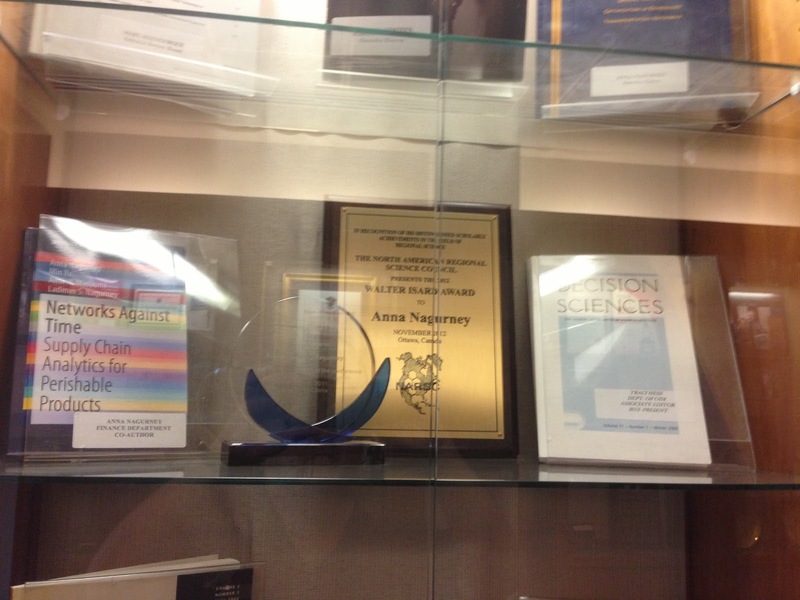 He was recognized for his sustained contributions to Operations Research and Optimization. Information on the selection committee is here. Panos has chaired 53 PhD dissertations! He is a gentleman, a scholar, and one of the most creative and productive people I have ever met. He is also one of the kindest. Just two weeks ago, I was with him in Athens, Greece, at the Network Models in Economics and Finance conference that he co-organized. The photo below is from that conference. And, on February 17, 2013, he was one of the panelists on the AAAS Dynamics of Disasters Symposium that I organized and which took place on Boston in which ORMS star Dr. Laura McLay also spoke. Congratulations to Professor Panos M. Pardalos on his receipt of the 2013 EURO Gold Medal -- so well-deserved! It has been a fabulous couple of months at the Virtual Center for Supernetworks at the Isenberg School of Management. 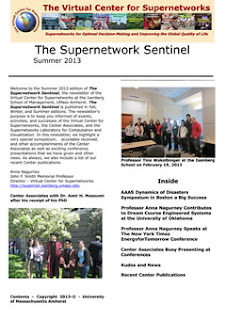 We are pleased to report that the 2013 Summer edition of our newsletter, The Supernetwork Sentinel, is now available online. It highlights the many professional activities of the Center's Associates. In it, you will find find a summary of the AAAS Dynamics of Disasters Symposium that I organized and which took place in Boston, Massachusetts and highlights of contributing to a Dream Course on Engineered Systems at the University of Oklahoma and to a panel at The New York Times EnergyforTomorrow Conference in NYC that I spoke at. You will also find information on awards and other recognitions received by the Center Associates, who are based on 3 different continents, and who provide a wide reach for our activities in research, education, and outreach on topics ranging from supply chains to innovations on the Internet to financial networks and even humanitarian logistics. In the 2013 summer edition, we also have news on our latest publications and notable conference presentations around the globe. Supernetworks are networks of networks and the associated methodologies and applications continue to grow. All editions of The Supernetwork Sentinel can be downloaded from The Virtual center for Supernetworks website. Enjoy and thanks for your support! is the John F. Smith Memorial Professor of Operations Management at the Isenberg School of Management at the University of Massachusetts Amherst. She was a Visiting Fellow at All Souls College at Oxford University for the 2016 Trinity term. She was a Visiting Professor at the School of Business, Economics and Law at the University of Gothenburg in Sweden for 2012, 2013, 2014, and 2015. Her latest book, co-edited with I. Kotsireas and P.M. Pardalos is: Dynamics of Disasters: Key Concepts, Models, Algorithms, and Insights, published by Springer in 2016. She is also the co-author of the book: Competing on Supply Chain Quality: A Network Economics Perspective, with D. Li, and published in 2016. She is the author of the book: Networks Against Time: Supply Chain Network Analytics for Perishable Products, co-authored with M. Yu, A.H. Masoumi, and L.S. Nagurney. She is also the author, with Q. Qiang, of the book: Fragile Networks: Identifying Vulnerabilities and Synergies in an Uncertain World, and several other books. She is the Founding Director of the Virtual Center for Supernetworks.